**Note: the measurements given below are for 1:24 scale. If you would like to make the washstand in 1:12, double the measurements (including the wood thicknesses). one base panel in 2mm thick wood (20mm x 30mm). 2. Glue the sides, back, top and base together as shown above right. The image shows the back of the washstand, with the sides glued on the outside of the back. 3. Glue the four feet on to the base of the washstand (pictured above left). These can be square in shape, or round. 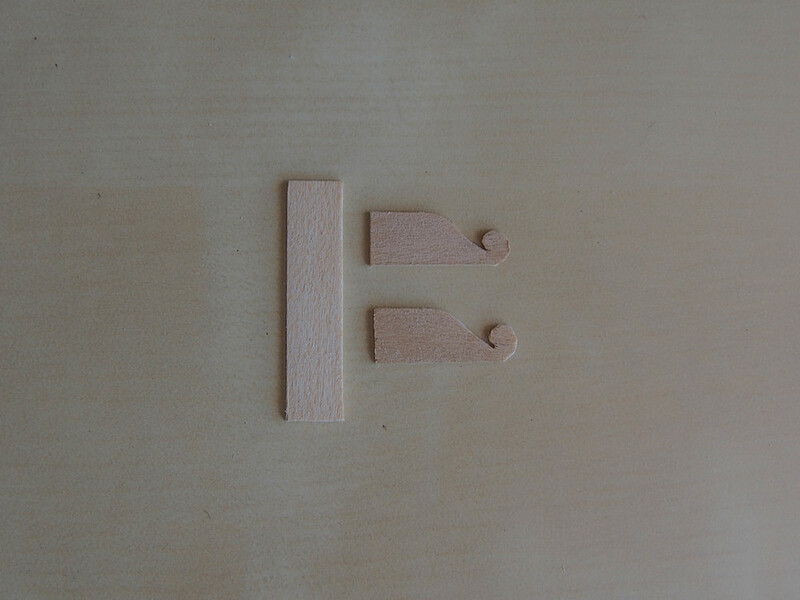 Round feet can be cut from a small piece of dowel. 4. Cut the three pieces which will form the surrounds of the washstand top. 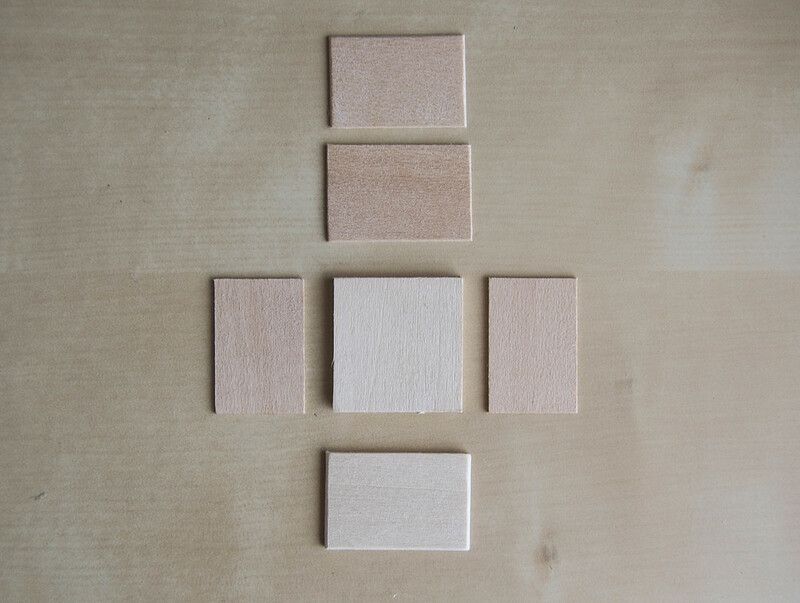 These can be plan and rectilinear in shape, or can be embellished (as pictured top right). 5. Now you can make the front panel of the washstand (pictured above left). Because the washtand will have false drawers, the front can be a single flat panel. However, you must still give the illusion of drawers. To achieve this, you must decide how many drawers you will have and cut pieces to form the drawers. Then, to show the horizontal shelf between the drawers, cut one small strip of wood to fit between the two which are cut for the drawer fronts. Glue these together then trim the excess from the small strip. Then glue on drawer handle knobs, either in pre bought bronze, or as shown, in wood. *TIP: Ensure that the grain in the strip and the drawers are not going in the same direction, otherwise when they are glued together it will be difficult to differentiate the pieces. 6. Now glue on the washstand top surround pieces as show above right. In addition, you must glue in small stoppers into the interior of the washstand so that the front drawer panel will not fall into the stand, but will stay securely flush with the front. 7. The final step is to create the towel rack for the side of the washstand. This can be achieved with jewellers wire. Bend the wire with pliers as shown top left. Next drill two holes on the side of the washstand, and using super glue, fix the rack in place. 8. Place your jug and bowl on top, and you're finished.